In a recent interview with Kaiser Health News, Cheryl DeMars and Kyle Monroe were quoted on “Medicare-plus” contracting. OpenNotes was highlighted at The Alliance Annual Seminar and the Wisconsin Health News newsletter on May 22, 2017. Alliance President and CEO was quoted in a Wisconsin Health News newsletter about payment reform, October 6, 2016. Updates to the QualityPath program were highlighted in David Wahlberg’s article, “Employer group steers workers to select providers for CT, MRI scans”, published on October 4, 2016 in the Wisconsin State Journal. This article was also published in the La Crosse Tribune, “Gundersen among providers to which employers are steering workers”. “AJRR appreciates The Alliance recognizing our dedication towards improving patient care,”- AJRR Chair Daniel J. Berry, MD. Read the American Joint Replacement Registry’s press release on their involvement with QualityPath. August 11, 2016. Cheryl DeMars offered her thoughts on the recent mergers between health care organizations in an article published on July 1, 2016 for the Wisconsin State Journal. Read ‘Is Self-Funding Healthcare Right for You?’ written by Cheryl DeMars. The article was published in the July 2016 issue of Wisconsin Business Voice. Beaver Dam Community Hospital has earned a Health Transformation Award from The Alliance. Read the press clipping, BDCH Wins Health Award, published on May 19, 2016 in the Daily Citizen. Leah Binder’s comments from The Alliance Annual Seminar on Wisconsin hospital safety scores are published in the May 17, 2016 issue of Wisconsin Health News. Wisconsin Health News published a newsletter article announcing the addition of Marshfield Clinic locations to The Alliance network and CT and MRI screenings to QualityPath, May 16, 2016. Wisconsin Public Radio released an article about QualityPath, “Group of Midwestern Businesses Aims to Reduce Expensive Medical Tests”, published May 12, 2016. Health Care Roundtable with Alliance President and CEO Cheryl DeMars and other industry leaders, published in InBusiness in April 2016. Read “Meeting Employers’ High Expectations for Health Care Consumers” by Cheryl DeMars in The Institute for HealthCare Consumerism’s quarterly publication, HealthCare Consumerism Solutions. The Alliance is referenced as a co-op success story in Frank Giancola’s article “Communication Failures Scuttle Changes of Establishing Health Care Co-op for Detroit Auto Workers”, Employee Benefit Plan Review. Alliance President & CEO Cheryl DeMars adds her perspective to this article, “‘Battle of reports’ a prelude to possible self-insurance move by state,” published on Jan. 6, 2016 on WisBusiness.com. Alliance President & CEO Cheryl DeMars spoke on a panel at the Self-Insurance Institute of America’s 35th Annual National Educational Conference and Expo. Read about the event in this article, “SIIA Conference: Is direct contracting ready for takeoff?”, on healthcaredive.com. Laura Carabello, editor and publisher for U.S. Domestic Medical Travel, mentions the panel in this Spotlight article. The Alliance congratulates The Wisconsin Health Information Organization (WHIO) on their 10 year anniversary. The Alliance is a founding member of WHIO. Alliance President and CEO Cheryl DeMars comments in this video beginning at 5:48. Alliance President & CEO Cheryl DeMars comments on the new UW hopsital in “UW Health brings hospital to Madison’s Far East Side,” published in the Wisconsin State Journal on July 27, 2015. Alliance President & CEO Cheryl DeMars spoke to HealthCare Consumerism Radio about QualityPath on May 13, 2015. Listen to the interview. Wisconsin Health News interviewed Alliance President & CEO Cheryl DeMars about the QualityPath initiative for a newsletter article published on May 1, 2015. Calvin Rigsby, Business Development Manager, contributed an article titled “Self-Funding Helps Employers Get What They Pay For” to the 2015 HealthCare Consumerism Outlook. The Institute for HealthCare Consumerism posted an announcement about QualityPath on its website on April 7, 2015. Mark Xistris, VP, Business Development & Provider Relations, describes the QualityPath initiative in “What Payers Seek from Orthopedic Destination Centers” for OrthoServiceLine.com, an online resource provided by Wellbe. Alliance President & CEO Cheryl DeMars comments on the ability of the cooperative to negotiate with hospitals and clinics on pricing in “Health Sense: Madison health care cost is high and low,” published in the Wisconsin State Journal on April 12, 2015. Alliance President & CEO Cheryl DeMars comments on the medical billing process in the January issue of InBusiness. Read the article. The Alliance has announced designated hospital-and-doctor pairings that have met or exceeded national standards for selected procedures. The announcement was covered by the Wisconsin State Journal in “Companies to steer workers to preferred doctors, hospitals” on Dec. 17, 2014. NPR produced an audio segment (.wav) covering the announcement. Some Madison-area workers will soon pay less for some care at selected hospitals due to The Alliance’s new program called QualityPath®. Read more about this program in the article titled “Companies to steer workers to select hospitals” in the Wisconsin State Journal. Wisconsin Health News released an article highlighting The Alliance’s announcement of QualityPath hospitals, read the article here. UW Health has announced a statewide partnership with five health systems and is planning to combine its hospital and doctor group into one organization. Alliance President & CEO Cheryl DeMars comments on the trend of consolidation in health care in “UW Health Changes Driven by Partnerships,” published in the Wisconsin State Journal on Aug. 14, 2014. Alliance President & CEO Cheryl DeMars and Judy Peirick, vice president of human resources for Alliance member Webcrafters, comment on the benefits of self-funding in an article for In Business, “Diving Into Self Insurance”, published in August 2014. Watch the extended version of Cheryl’s testimony with follow-up questions. Watch the hearing in its entirety. The Alliance is a Consumer Reports Health partner. The Alliance helps promote a Consumer Reports campaign called Choosing Wisely, which aims to help physicians and patients engage in conversations about the overuse of medical tests, treatments and procedures. The Alliance supports efforts to build a better application to help doctors keep up with new information and determine which tests and treatments are necessary. The idea, called SMARTCare, was recently awarded a $15.9 million federal grant. Read about the idea in the Wisconsin State Journal. The Wisconsin Association of Health Underwriters (WAHU) published two newsletters highlighting the presentations given at The Alliance Annual Seminar. Wisconsin Health News covered The Alliance Annual Seminar: Advance the Transformation in a newsletter article titled “Experts highlight keys to success amidst changing healthcare environment at Alliance seminar”, on May 7, 2014. President & CEO Cheryl DeMars speaks about the QualityPath initiative in this interview with Hospitals & Health Networks on May 1, 2014, while attending the Midwest Business Group on Health’s annual meeting. A video interview with Brian Klepper, CEO of the National Business Coalition on Health (NBCH), is also included in this report. President & CEO Cheryl DeMars is quoted in this report by Shamane Mills for Wisconsin Public Radio on April 14, 2014: “‘Choosing Wisely’ Program Asks Doctors What Procedures Should Be Questioned”. President & CEO Cheryl DeMars comments on health care reform as part of a five-member panel of health industry experts for In Business in its April 2014 feature, “Navigating Obamacare”. Chief Operating Officer Paul Meyer has joined the Catholic Charities 2014 Board of Directors. Catholic Charities provides charitable services to an 11-county area of southern Wisconsin and is a participating agency of the United Way. Read the announcement in the Wisconsin State Journal posted on April 3, 2014. President & CEO Cheryl DeMars provides details on the value-based benefit design pilot program and the QualityPath initiative in a Q & A session with Wisconsin Health News on October 25, 2013. Wisconsin Health News mentioned The Alliance Annual Meeting in a newsletter article titled “The Alliance highlights increased membership, quality initiative at annual meeting”, on October 23, 2013. QualityPath™ is featured in the Wisconsin State Journal on October 20, 2013. Read this article highlightingQualityPath™ and learn why many Alliance members, including Colony Brands, Park Bank, Stoughton Trailers, Trek and Webcrafters, are supporting this initiative. President & CEO Cheryl DeMars is quoted in Chris Rickert’s column, “Just call it ‘Walkercare,'” published in the Wisconsin State Journal on October 6, 2013. President & CEO Cheryl DeMars sends a letter to the editor of the Wisconsin State Journal, “Be thoughtful during self-insured decision,” published on October 7, 2013. President & CEO Cheryl DeMars is quoted in “Union, insurers concerned about self-insurance proposal for state employees” by David Wahlberg for the Wisconsin State Journal on October 2, 2013. Annual Seminar speaker Dr. John Santa says it’s difficult to convince Americans that “more is not better” when it comes to health care. Dr. Santa and keynote speaker Shannon Brownlee are quoted in “Health Sense: Culture shift needed to say no to some health care” by David Wahlberg for the Wisconsin State Journal on May 27, 2013. Wisconsin Public Radio featured a news story covering some of the key points attendees learned at The Alliance Annual Seminar: Overwhelmed by Overtreatment. Listen to the story produced by reporter Shamane Mills on May 11, 2013. Annual Seminar speaker Dr. John Santa comments on a grant awarded to the Wisconsin Collaborative for Healthcare Quality in “Collaborative receives grant to promote ‘wise choices'”, posted by Wisconsin Health News on May 8, 2013. The Business Health Care Group (BHCG) has partnered with The Alliance to share information about the Affordable Care Act as it impacts employers. BHCG announced the “collaborative resource-sharing arrangement” in the April 2013 edition of their newsletter, The Catalyst. President & CEO Cheryl DeMars is quoted in “Employers, insurance companies prepare for health reform exchange” produced by David Wahlberg for the Wisconsin State Journal on the increased interest in self-funding due to health reform exchanges. This article was posted on April 29, 2013. President & CEO Cheryl DeMars is quoted in “At Issue: Should insurers be able to set fees for services they don’t cover?” by Sandy Cullen for the Wisconsin State Journal, on the case against the proposed legislative bill (AB109, SB131) stating that insurers could not require dentists to set fees for certain services if procedures are not covered under the insurers’ policies. This article was posted on April 28, 2013. President & CEO Cheryl DeMars comments on health care technology and the added responsibilities that both providers and patients will have in the future, in “Turning to Telemedicine,” published in the Vision 2020 section of The Janesville Gazette on April 7, 2013. Mark Xistris, Vice President, Business Development & Provider Relations, comments on the cost of a new Digestive Health Center in “A sign of the future, new Digestive Health Center is Madison’s third” in the Wisconsin State Journal on April 2, 2013. Webcrafters Inc., a founding member of The Alliance, is featured in “Health Sense: State employees asked to do health risk assessments” in the Health & Fitness section of the Wisconsin State Journal on Feb. 17, 2013. Webcrafters has increased employee participation in health risk assessments by offering incentives such as cash, lower monthly premiums, and even a chance to win a free year of health insurance. Read more about employee wellness at Webcrafters in this case study. President & CEO Cheryl DeMars discusses The Alliance, QualityCounts®, and health care construction in an interview with Wisconsin Health News on Oct. 26, 2012. The Alliance Annual Meeting speaker Hank Orme, President of Lincoln Industries, gave a presentation that is covered in “Manufacturing executive makes business case for wellness programs“, in Wisconsin Health News on October 24, 2012. Mark Xistris, Vice President, Business Development & Provider Relations, offers his thoughts on new census data in “Americans Making Fewer Visits to the Doctor”, for Wisconsin Public Radio News on October 9, 2012. The Alliance Past Chair Michael McDonald is quoted in “Beyond Discounts: Employer-Sponsored Health Care Coalitions”, in an article by the Wisconsin State Council Society for Human Resource Management (SHRM), published online on September 11, 2012. President & CEO Cheryl DeMars comments on the construction of new health clinics in “Healthy competition? Critics say consumers lose as providers build, bicker” in the Capital Times on September 19, 2012. Reactions to Supreme Court Ruling on PPACA including comments from Alliance President & CEO Cheryl DeMars in the Wisconsin State Journal and the Janesville Gazette on June 29, 2012. President & CEO Cheryl DeMars is quoted in “Health leaders react to Fisher’s comments”, from Wisconsin Health News highlighting Dr. Elliot Fisher’s thoughts on Madison area hospital expansions, on March 1, 2012. This article, “Insurance can determine patient destination”, published in the Janesville Gazette on Dec. 12, 2011, describes the broad choice Janesville area employers offer their employees and dependents through The Alliance. President & CEO Cheryl DeMars agrees that there are problems with certificate-of-need programs in “Health care needs aren’t easily measured” in the Janesville Gazette on Dec. 11, 2011. President & CEO Cheryl DeMars comments on the lack of objective data to justify the need for more health care facilities in “Janesville in midst of health care building boom” in the Janesville Gazette on Dec. 11, 2011. President & CEO Cheryl DeMars explains four goals employers should consider as part of a strategic approach to managing health and health benefits, in “Value-Based Purchasing: How Employers Can Get Better Quality, Lower Cost Health Care”, for Corporate Report Wisconsin on Nov. 23, 2011. President & CEO Cheryl DeMars is quoted in “Janesville residents get more options in health care” in the Wisconsin State Journal on November 25, 2011. President & CEO Cheryl DeMars contributed her expectations for premium increases to the article “Rate hike for the holidays”, by Chris Rickert, in the Wisconsin State Journal on Nov. 13, 2011. A number of Alliance members are featured in the November Corporate Report Wisconsin article Curbing Health Care Costs. Alliance President & CEO Cheryl DeMars discussed health care reform, controlling costs, the future of health care and more during a health care roundtable for the Oct. 2011 issue of Corporate Report Wisconsin. Listen to the audio recording that is included in our Annual Report. The newsletter article is available on crwmag.com. President & CEO Cheryl DeMars is quoted in “Meriter, UW Hospital feud could limit choices, raise costs” in the Wisconsin State Journal on July 17, 2011. Read about the success of The Alliance’s employee wellness program in one of several “Working for Health Success Stories” featured by Thrive. President & CEO Cheryl DeMars is quoted in “Hospital building blitz in high gear” in the Wisconsin State Journal on May 22, 2011. President & CEO Cheryl DeMars is quoted in “Meriter, UW hospitals argue over what’s best for local health care”, by Chris Rickert, in the Wisconsin State Journal on May 13, 2011. President & CEO Cheryl DeMars is quoted in “Meriter cries foul over UW Health plans for East Side property” from the Wisconsin State Journal on May 7, 2011. President & CEO Cheryl DeMars is featured in this article on health care reform in Corporate Report Wisconsin. President & CEO Cheryl DeMars joined a panel discussion with WHIO and several other organizations at the Wisconsin Women’s Health Foundation’s 5th Annual Dialogue on September 14, 2010. Read the white paper (.pdf) which was made available in March 2011. President & CEO Cheryl DeMars participated in a Health Care Reform Roundtable on March 1, 2011. Read the report by In Business magazine. President & CEO Cheryl DeMars spoke to Northern Illinois employers at the Miller Buettner and Parrott Annual Client Seminar in Rockford, Ill. Watch video coverage of this event broadcast by NBC affiliate Channel 13 WREX-TV. President & CEO Cheryl DeMars is quoted in “Area Health Systems Jostle for Patients” in the Wisconsin State Journal on January 24, 2011. Learn how The Alliance is helping members navigate the changing health benefit landscape in this November/December 2010 Corporate Report article. Features President & CEO Cheryl DeMars and Board Member Wendy Culver of Mead & Hunt. Purchasing High Performance, a quarterly bulletin from the National Business Coalition on Health and the Commonwealth Fund features an article, “Are You Ready for September 23rd?” including perspectives from President & CEO Cheryl DeMars. Cheryl DeMars, president & CEO, served on a panel of speakers at the Wisconsin Women’s Health Foundation Dialogue “Bending the Cost Curve, Wisconsin Style: How to Improve Wisconsin’s Health Care Value.” The panel discussion is highlighted in this WisBusiness.com article. Wisconsin State Journal editorial calls for legislation forcing hospitals and providers to disclose facility fees to patients ahead of care. Wisconsin State Journal article on facility fees features Cheryl DeMars, president & CEO of The Alliance. Cheryl DeMars, president & CEO of The Alliance, discusses facility fees in the InBusiness Madison “Open Mic” blog. Vikki Brueggeman, director of human resources for Alliance member Zimbrick Inc., is quoted in this article from the Wall Street Journal about facility fees. President & CEO Cheryl DeMars is quoted in this Washington Post article about facility fees. Provides information on Assembly Bill 207 (AB 207) that would require disclosure of facility fees to patients, which is being supported by The Alliance. 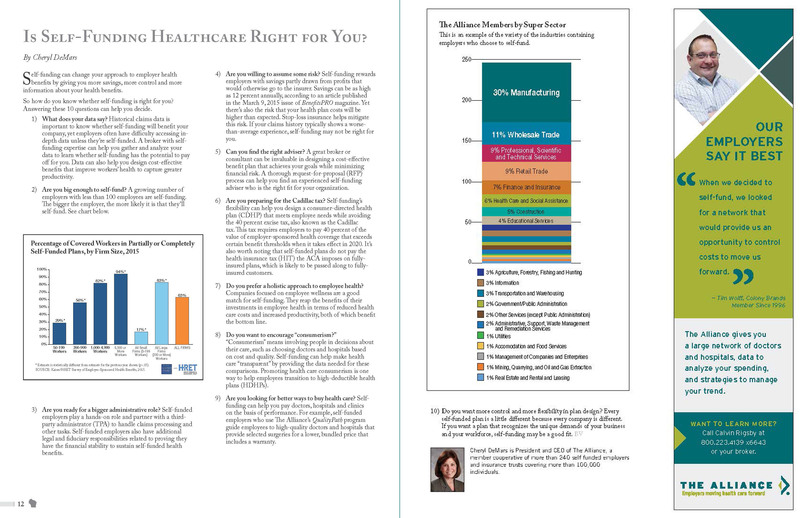 The Alliance President & CEO Cheryl DeMars is featured in the Oct. 2008 Capital Region Health Care report. In Business, September 2008: Don’t miss President & CEO Cheryl DeMars in the September 2008 issue of In Business. She is featured in their health care roundtable. “Pay for performance” compensates providers who deliver higher quality care by paying them more. Read about The Alliance’s pay for performance program in the Wisconsin State Journal.